Vrindavan, 7 km away, the town so intricately woven with the playful pranks of Lord Krishna who used to tease the village maidens and later immortalized by Meera Bai, the devote queen to Lord Krishna, is the principal religious centre of Braj Bhoomi. Apart from various religious spots associated with Krishna, the two most important once are Gokul, 15 km away, where the infant Krishna was brought in secrecy and the home of its foster mother, Jashoda Maiya, and Mahavan, 18 km, associated with the early childhood of Lord Krishna. Goverdhan, 26 km from Mathura, is the hill, which according to Hindu mythology, Lord Krishna held aloft to protect the people of Braj Bhoomi from the wrath of Indra, the God of rain and thunder. Nandgaon, which is 56 km from Mathura, is the home of Lord’s foster father Nand. Important sites of the town are a temple devoted to Nand and Pan Sorovar. 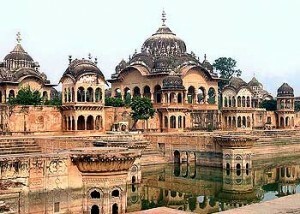 Barsana, 50 km from Mathura is the home town of Radha Rani. Four prominent hills are adorned by temple in honor of Radh. 20 km from Mathura is Baldeo named after the elder brother of Lord Krishna Baldeoji. Accommodation facilities are available at numerous ashrams and dharamashalas in the town. U.P. Tourism’s Tourist Bungalow, International Guest House and Railway Retiring Rooms provides for accommodations at Mathura city. In addition, there are a number of hotels, guesthouses and lodges. This entry was posted in Uttar Pradesh, Vrindavan and tagged Holy Place. Bookmark the permalink.